Few things raise the beauty of your home quite like having artwork hanging on the walls, but hanging your piece is only the first step. In order to get the maximum impact from your art, you need to make sure it is properly lit. For many homes, this is a greater challenge than it seems, as our lighting is rarely directed to the walls, and almost never set up in a way that best highlights or flatters a piece. 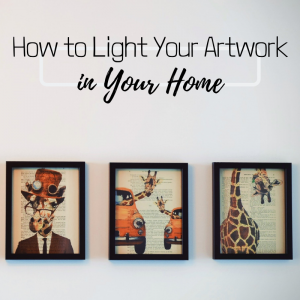 Some artists create works that are expressly designed for substandard lighting, but most great pieces will require some effort to ensure you are getting the greatest pleasure from your artwork on display. When it comes to lighting artwork in your home, LED bulbs is the absolute best choice. First, the light cast from these bulbs is more even in its coloring, ensuring that the shades of your piece are able to be displayed naturally, without any odd tinting that can occur with the unnatural coloring of incandescent or fluorescent bulbs. LED bulbs have the added benefit of not producing heat in the same way more common bulbs do, which means they won’t damage your piece over time. While LED bulbs can be more expensive, they are cheaper to run, which in most homes will balance out over time. When it comes to the specific type of light to use, there are a few popular options. The most obvious is to go with is a picture light. This a smaller curve necked lamp that’s mounted directly on the picture frame and angled to provide light specifically to the artwork you are displaying. As a dedicated light, it’s a favorite for its ability to draw focus to the piece itself. That focus can be a downfall though as it may provide too much light depending on the piece and wash it out. Further, since it lights only the piece itself, it doesn’t do much else for the room. For these reasons, track lighting is often a popular choice, allowing you more flexibility. This helps if you have multiple pieces you may want to change around, or display in different configurations. Track lighting allows for light to be more diffused and give a more natural appearance to your piece. Track lighting, however, can be expensive to install and some homeowners don’t like the more mechanical look it brings. For some people, using portable floor lamps can be an acceptable compromise, particularly in cases where you are renting your home, or you may just be starting out in art collection and wish to limit your initial investment. One thing to keep in mind, if the top of your painting is lit more brightly than the bottom, your eyes will often interpret the painting as evenly lit when looking up at it, so play with different placements and looking at the painting to get a full idea of how it appears. Remember, the artwork you have purchased is there to give meaning and beauty to your room, so having it properly lit helps it accomplish that job. This is worth putting just as much time and effort into as deciding on the piece itself. You won’t regret spending the time to have a well lit piece.